Purefecto: Lilly Pulitzer for Target scarf giveaway! It's summer time! 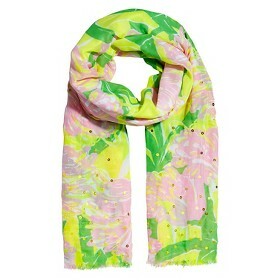 I'm giving away this light weight hard to find Lilly Pulitzer for Target scarf. You may have heard that Target was wiped clean of LPfT over a month ago due to huge demand for Lilly Pulitzer's gorgeous prints. Here's your chance of adding a little sparkle into your life! Thank you for entering and check back in a week to see if you won! Please note: apologies to my international friends - I wish I could extend these giveaways to you but legal restrictions prevent it. Thanks for understanding. Yay thank you so much for doing a giveaway! :) my favorite print is this one! Fan dance! What an awesome giveaway! I'm digging the upstream pattern. Thank you offering us such a beautiful Unicorn! Love your giveways! Also my favorite pattern is Nosie Posey! Love the colors and hidden kittys! Giraffeeey is pretty cute too. See Ya Later, because of the coloring and the alligators! Love pineapple punch! & of course noise posie---what seems to be the favorite from the collection! Fan dance & my fans! Love all the scarfs in this collection! Thank you! I don't own any scarves, but I love all of the patterns. This is such a great summer scarf. Thanks for the giveaway! I love them all, but pineapple punch was a must have then it was my fans and fan dance, SYL and sea urchin. All of the prints are adorable! But if I had to pick a favorite, I'd probably go with Nosie Posey. It's so bright, colorful, and fun, yet tasteful and with the classic Lilly flare! Upstream is a very close second, though! You are so sweet for doing a giveaway! I have yet to find a lilly print I dont like :) good luck to all entrants! Thanks for your giveaway. I don't have any Lilly Pulitzer scarves yet. My favorite I think is NP! But I've been looking for the fan dance scarf for my mom! Thanks for the giveaway! I adore Lilly and of course, I couldn't get anything when it was at Target. It just happened way too fast! Thanks for the giveaway. The scarf is lovely. The combination of pink and green are my all time favorite colors, I would love to cheer myself up with this scarf. Thank you for the chance. It is so pretty!